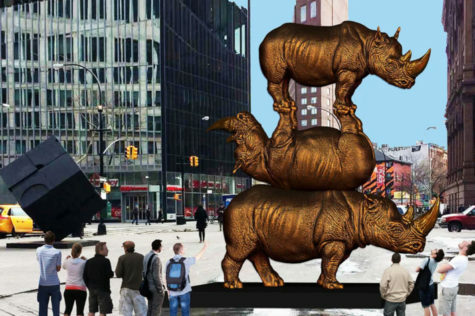 The Last Three, the seven-ton, 17-foot-high “tallest bronze rhino sculpture in the world,” made by the Australian “extraordinary public artists” Gillie and Marc — who, according to their website, “first met on a film shoot in Hong Kong; then 7 days later, ran away to Nepal and married on the foothills of Mt. Everest and whose unparalleled love is the cornerstone of what they are and what they create” — is now installed a few feet from Alamo, the spinning black cube by Bernard Rosenthal at Astor Place and Lafayette Street. Jerry Saltz comments: ‘It is an ugly, bathos-filled folly that proves my adage that 95 percent of all public sculpture is crap. Thank goodness this crap is only temporary.’ Okay! Why Can’t TV Show Astor Trial?